In the series on church growth we have covered the need for a plan, the idea of describing the various church stakeholders and their expectations and requirements, the components of a logic model, the mission, vision, and values statement, and the last idea to cover before we get on to describing goals is a SWOT analysis. A SWOT analysis is simply a description of the church's Strengths, Weaknesses, Opportunities, and Threats. Strengths and Weaknesses tend to be internal dimensions and Opportunties and Threats are external dimensions. Specifically, what are the strenths, weaknesses, opportunities, and threats of PMUC. Some of our strengths are that we have a very beautiful and useful building and location, our long history in the community, and a small but very committed group of parishoners. Weaknesses include our small numbers, our financial problems, and the fact that we are a liberal religion in a conservative area. Opportunities include our positive values which the world badly needs and the fact that especially in the younger generation there is an interest in a more liberal view of life. Threats are increasing costs to maintain and operate our building and the aging of our congregation. You can add your ideas to each of these categories to further enrich the data sets in each category. We also can ask other stakeholders what their ideas are about PMUC's strengths, weaknesses, opportunities and threats. Once we have captured this data, the data sparks ideas about goals, about things we should work toward in improving our church. 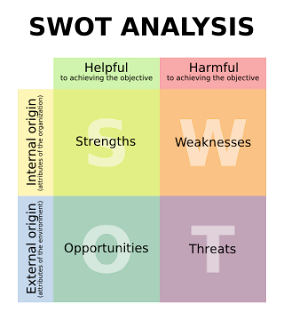 Video on SWOT analysis lasts 5:21. This is article #12 in a series on Birth Of A Congregation.